A mid-sized croquet set for hours of fun! Made specifically for beginners and younger players, the Sussex Set has hours of fun to offer your entire family. The four-player set comes in a strong canvas carrying case, and includes comprehensive, easy-to-follow game rules and instructions. 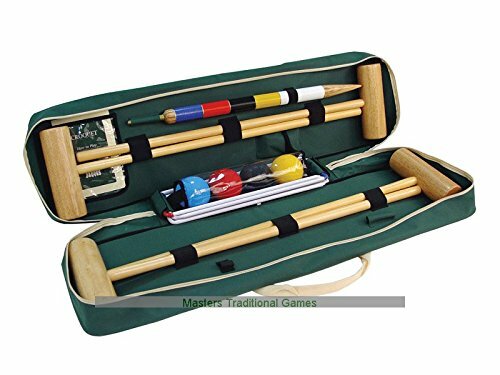 This quality Jaques croquet set consists of the following pieces of equipment:4 mid-size, 32-inch mallets Mid size Sussex balls Challenge hoops Winning post Croquet clips Don't let summer pass you by. The Sussex Croquet Set makes sure you and your family enjoy hours of fun in your garden or back yard. High-quality croquet for younger players. 4 intermediate sized mallets - 32 inches high. 4 mid-size balls, hoops, a winning peg, and clips. Everything you need to start a game right away. Comes in a durable canvas carrying case. If you have any questions about this product by Jaques of London, contact us by completing and submitting the form below. If you are looking for a specif part number, please include it with your message.